The colors that you see on your monitor are comprised of red, green and blue light. When printed, they are converted to the four colors of toner that the digital printer uses to print. This conversion will cause color changes. The color on the monitor is not a truthful representation of what the color will look like when printed. Not only does every monitor show color differently, it can show many colors that are unprintable by any printer. 1. One method is to obtain printed sample pages (see the bottom of this page) from us and compare those printed pages to the same pages on your screen. You will then want to adjust the colors of your monitor to match our printout. For example, if your sample pages appear more "red" (magenta) than your screen shows them, you can increase the red cast of your monitor to show are more accurate representation of our printout. 2. 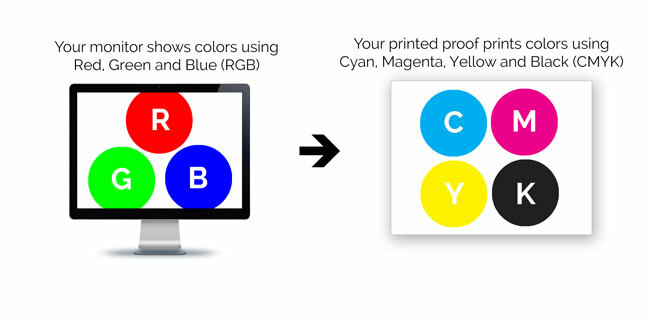 Another method is to convert your images from RGB to CMYK. This will give you a closer onscreen view of how the color will appear in print. While you can use this method, it is not recommended. Keeping your images in RGB will result in more accurate, and better, color. 3. For users of Adobe Create Suite software, you can use the View>Proof Setup option to view your proof using the CMYK Working Space (Coated GRACol 2006 Color Space, see the Software Settings below). Gorham Printing cannot provide software support for your specific software. We recommend learning more about color management settings from your software manufacturer. Also, be aware that changing default color management settings can result in unexpected color changes in your file, make changes carefully. Our high-quality printers print in CMYK color and are calibrated to G7 color standards. We calibrate and test daily to insure that our color is consistent from day-to-day for visual accuracy. For photographs only, you will get the richest and most accurate printed colors by keeping your images in RGB mode. However, your screen will show RGB images inaccurately, and will show them brighter than they will print. So as long as you do not consider your printed RGB images to look like your screen, keeping them as RGB will result in the best printout. For flat areas of solid color, create that color using percentages of CMYK, not RGB. This is known as a "build" of CMYK. Solid areas color made created using RGB can result in an unwanted color shift. For example, a solid red should be made with 0%C 100%M 100%Y and 0%K. DO NOT USE PANTONE SPOT COLORS in your file, the file will not print correctly. We do not use spot colors in our printing process. Black type should be 100% black (K only: no C, M, or Y). Keep your type vector whenever possible, not screened. White type should be 100% white. Keep your type vector whenever possible. Question: "My proof doesn't match what's on my home computer." Your monitor will not likely match our printout. So which version is correct, your home computer or our printout? Our printers are calibrated daily to a known standard. Your monitor may show an inaccurate view of your file in many ways; the color may be off (it can be too blue, too red, or too yellow, for example), or your monitor can be too bright. Essentially, your monitor is misleading you, by showing you an incorrect view of your file. To achieve best color, you will need to first purchase sample pages or a printed proof, and if you see anything you would like to change about the color, you will need to adjust your file, and re-submit for another printed proof or more sample pages.